You’re on your way to a Fourth of July barbecue and you just realized, “Oh my God, I didn’t make anything to bring.” If you’re not packing a big hunk of meat to put on the grill, the next most-American thing you can bring to a cookout is potato salad. All of these recipes are a giant leap above the mayonnaise-soaked stuff you’d buy at the store on your way over and, other than pantry staples like oil, vinegar, salt and pepper, they have five ingredients or fewer. You can arrange the potatoes to make an American flag. Or a French flag if you want everyone to be angry with you. 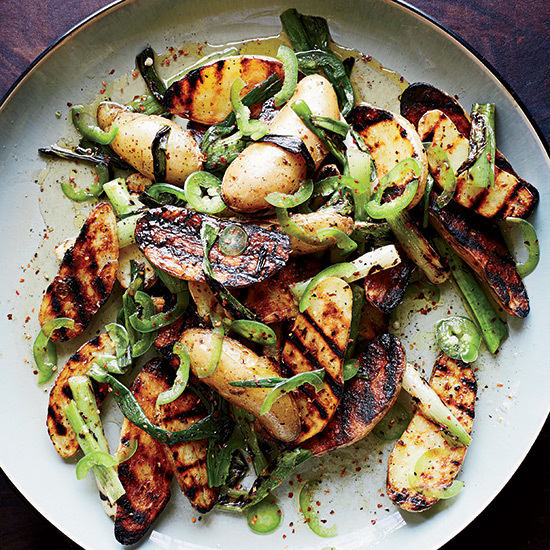 Grilling adds a nice char to this salad to give it a more complex flavor. Adding fresh goat cheese will make you a hero at the barbecue. Using fingerling potatoes speeds up the whole cooking process. You’ll be done and out the door in a half an hour. Crème fraïche takes the place of the sometimes burdensome mayonnaise.